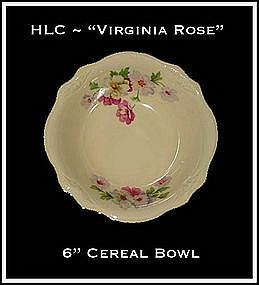 This signed, genuine HLC Fiesta 8 1/4" serving bowl has never been used and is in excellent condition! It is a contemporary design and is for the holiday festivities! I don't know what the official name of this color is, but I would call it Maroon. 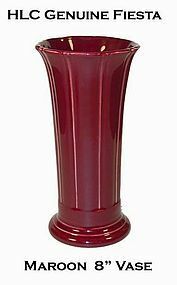 It is a reissue of the original Fiesta 10" vase that was made in the 1930's. This was made around the 1990's. We hand picked these vases right at the factory. I don't know what the official name of this color is, but I would call it Maroon. It is a reissue of the original Fiesta 8" vase that was made in the 1930's. This was made around the 1990's. We hand picked these vases right at the factory. 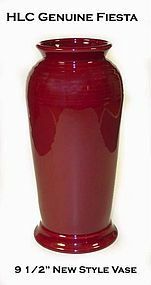 I don't know what the official name of this color is, but I would call it Maroon. 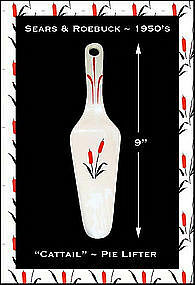 It is a modern style of the original Fiesta 9 1/2" vase that was made in the 1930's. This was made around the 1990's. It was never released when the early Fiesta was made, but a more contemporary style to fit in with todays designs. Very chic! We hand picked these vases right at the factory. HLC~Homer Laughlin China Co.~12" Logo Plate ~ Super! 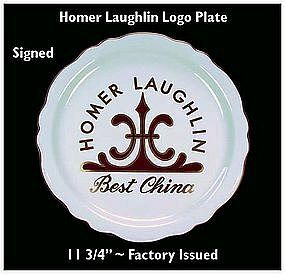 This is a Logo plate made by The Homer Laughlin China Co in the 1980's. They were only available at the factory in the outlet store. It is in mint condition! This mug was made in the 1970's for the General Motors Buick executive meetings. 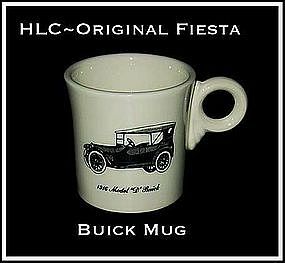 This 1916 Buick mug is one of two that we have for sale. It is in excellent condition! This mug was made in the 1970's for the General Motors Buick executive meetings. 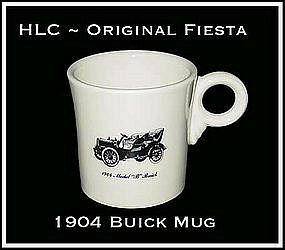 This 1904 Buick mug is one of two that we have for sale. It is in excellent condition! Multiple items can be combined to save on shipping. 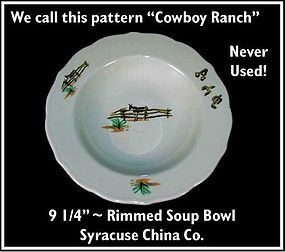 Unused rimmed flat soup bowls with a western decoration. We call this "Cowboy Ranch" but we don't know the real pattern name. The pattern shows wooden fences, horses, desert plants, and a western brand. Super nice!!! 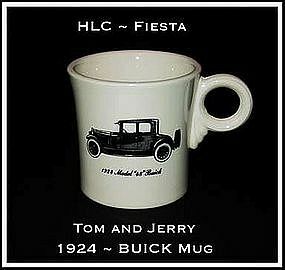 This genuine Fiesta Tom and Jerry mug was made by the Homer Laughlin China Co. It is one of the BUICK advertising mugs from the annual Buick Company meeting in the 1970's, and is in MINT condition! 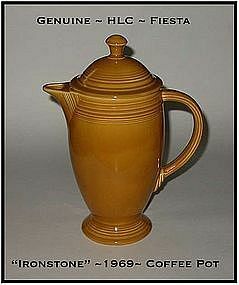 This 1969 gold colored Ironstone coffee pot was made by the Homer Laughlin China Co. and is in excellent condition. 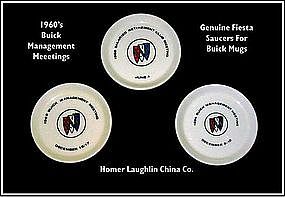 These are the saucers for the Buick Tom and Jerry mugs that were given to attendees of the GM Buick Management Meetings in Lansing Michigan in the 1960's. All are in excellent condition! 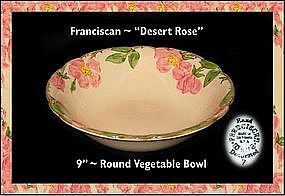 These Franciscan Desert Rose 9" bowls are made in California and are in excellent condition! 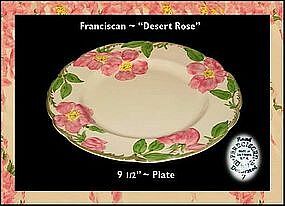 This Franciscan Desert Rose 9 1/2" plate was made in California and is in excellent condition! Superior condition! Excellent platinum trim! These 5 1/2" bowls look to be unused. 3 signed, 2 not signed. 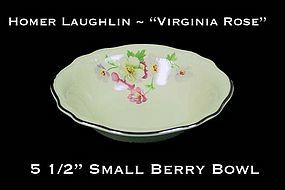 Homer Laughlin Virginia Rose 6" cereal bowl in excellent unused condition! 1 signed, 1 not signed. Beautiful! This size is hard to find. This pie lifter was made for The Sears and Roebuck Co. in the 1950's for their "Cattail" dinnerware line. It is in excellent vintage condition! It was probably made by Universal Cambridge China Co. 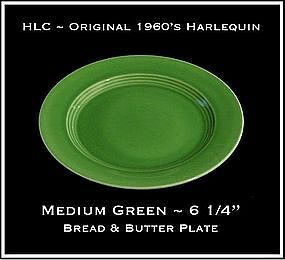 This original medium green Harlequin 6 1/4" bread & butter plate is in excellent condition! 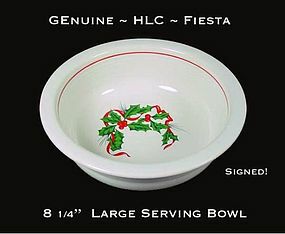 It was made by the Homer Laughlin China Co. after 1959, mostly as an alternative to Fiesta ware and sold at the 5¢ & 10¢ stores. 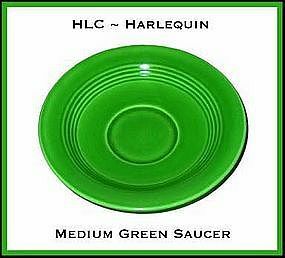 Hard to find medium green Harlequin cup ring saucer made by Homer Laughlin China Co. in excellent condition.